The OPTISTATION -3000 series is newly equipped with Nikon's acclaimed CFI60 optics, producing clear images with high contrast and minimal flare. DUV microscope module can be mounted as an option to meet the most advanced design rules that are increasingly becoming finer. *Equipped with Nikon's proprietary CFI60 optics to produce clear images with high contrast and minimal flare. The Dark field signal-to-background ratio is three times higher than with conventional Nikon optics, ensuring significantly better imaging. * Nikon's acclaimed wide illuminator (WIL) and line illuminator (LIL) enable macro inspections under ideal conditions. * Can be equipped with the newly designed DUV microscope module (as an option), supports the latest design rules. * State-of-the-art image processing and analysis technology enables highly accurate review inspections by using ADC. This ADC can also be used as a dedicated review station. 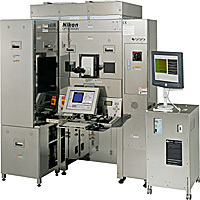 * Flexibility in load port positioning allows the OPTISTATION-3000 series to meet a variety of layouts and requirements of factory automation handling φ300mm wafers. OHT and other automatic transfer systems are supported too. * Optimal recipe conditions are simply created by an easily accessible touch-screen. According to specifications of objective lens and wafer that is inspected, optimal observation settings, including aperture and light intensity can be set in advance.